The boss of High Street retailer Boots "ought to pay his taxes" rather than "lecture people" about how to vote, Labour leader Ed Miliband has said. Mr Miliband was responding to criticism from Stefano Pessina who suggested a Labour government would "not be helpful" and could be a "catastrophe". The Labour leader said the likes of Mr Pessina were in an "unholy alliance" with the Conservatives to fight change. The Tories said politicians should back not attack "wealth creators". The BBC's Norman Smith said Labour seemed determined to step up the row with Mr Pessina, despite criticism it risks presenting the party as anti-business. Mr Pessina, who is chief executive of Boots' parent company Walgreen Boots Alliance, questioned Labour's business credentials in the Sunday Telegraph, suggesting a Labour government would "not be helpful for business nor the country". "One thing is to threaten and to shout, but it is completely different to be in charge and to manage the country day to day," he told the newspaper. "If they acted as they speak, it would be a catastrophe." In response, Labour has pointed out that the Italian businessman does not live in the UK and questioned whether Boots, which merged with Alliance Unichem in 2005 and recently joined forces with US firm Walgreens, pays its fair share of tax. In a question-and-answer session with young people on Sky News, Mr Miliband said "people at the top" needed to show responsibility when it came to paying taxes and he would brook no criticism from a "tax exile from Monaco". "I don't think people in Britain are going to take kindly to being lectured by someone who is avoiding his taxes, on how they should be voting in the UK general election." During a visit to Milton Keynes, Mr Miliband was asked whether he needed to do more to convince the business community of Labour's goodwill. "I am really proud of our agenda for British business, whether it is cutting small business rates or reforming our banking system or helping businesses with their energy costs." Labour's response to Mr Pessina's comments has been criticised by some other business leaders in Tuesday's Daily Mail and Daily Telegraph, which said Mr Miliband was accused of "trying to shut down" criticism of his policies with "personal attacks" on critics. One of the business leaders featured is Lord Rose, a Conservative peer and the former chief executive of Marks and Spencer. In response, the Labour press office tweeted: "No-one should be surprised a Conservative politician is attacking the Labour Party." Labour has faced criticism from the business community for a number of its policies, notably its proposed freeze on electricity and gas bills and its pledge to raise the top rate of tax from 45p to 50p. Pro-business figures in the party, such as former business secretary Lord Mandelson, have also urged the party to be careful in the language it uses on business issues. Marcus Bowman, the head of the UK Chamber of Shipping, urged politicians from all parties to refrain from "whipping up a storm of concern" about issues ranging from the UK's place in Europe to taxation and regulation in pursuit of votes. "It is a tough market and businesses need to know what is going to happen after the election - there is considerable uncertainty," he told BBC Radio 4's World at One. Shadow Chancellor Ed Balls said the "biggest risk" to business would be for the UK to exit the European Union, a move he said Labour completely rejected. "When I was in Washington a couple of weeks ago, the big fear of US policymakers was a Tory government taking the UK out of Europe," he said. He added: "Even though Mr Pessina has moved the tax domicile of Boots to Switzerland, the only tangible thing he said was his fear was of Britain leaving the EU and that is what I hear from businesses up and down the country all the time." A spokesman for Walgreens Boots Alliance insisted Mr Pessina's comments had been "taken out of context". "As a businessman, international entrepreneur and investor, he takes a natural interest in a broad range of topics within the economic landscape of countries where he has business interests, like he has done previously in the UK, Europe and the USA. 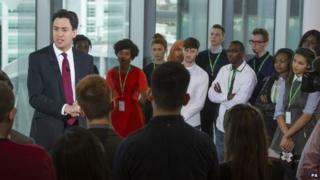 In his Q&A with 18 to 24 year-olds, Mr Miliband also said he could not promise to bring back the educational maintenance allowance for low-income pupils scrapped by the coalition but suggested he wanted restrictions on unpaid internships. Asked what experience he had of life outside politics, Mr Miliband cited his time as an adviser in the Treasury and a year lecturing in European politics at Harvard University in the US, which he said had enabled him to "listen and learn" from young people.